From left, Rep. Tami Zawistowki, Rep. Gail Lavielle, Rep. Pam Sawyer, Sen. Cathy Osten, Rep. Bill Aman, Sen. Dante Bartolomeo and Sen. Toni Boucher raise awareness about ConnecticutâÄôs safe havens law. 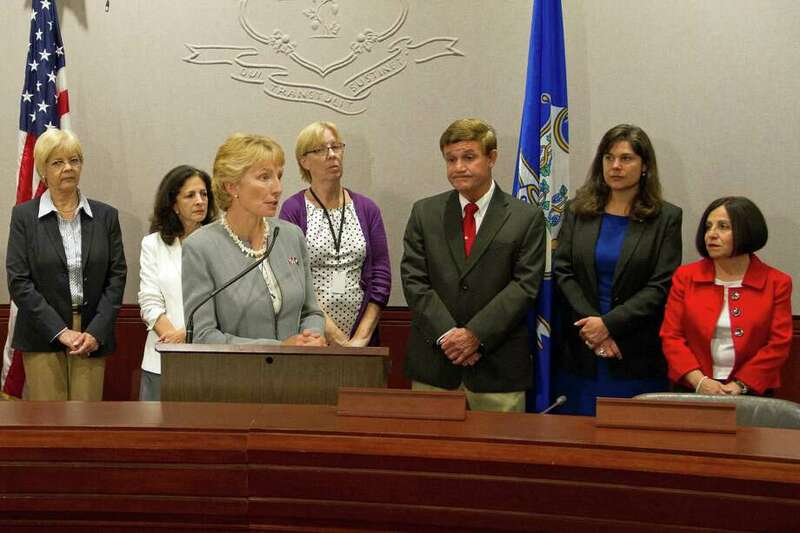 After hearing the tragic story Aug. 13 of an infant found dead in an East Hartford trash can, state Sen. Toni Boucher, R-Wilton, joined several of her colleagues to help raise awareness about Connecticut's Safe Havens Act. Under the law, if a baby is 30 days old or younger, the parent can bring the infant to any hospital emergency department in Connecticut, and the parent will not face criminal prosecution for abandonment. The parent is not required to give information, and the baby will be cared for and placed by the state Department of Children and Families with a licensed family who wants to adopt. Since, the law took effect in 2000, there have been several Safe Haven babies -- all of whom have been adopted or are living permanently with a relative. "This life-saving law protects both children and mothers," Boucher said. "This public-private working group will seek ways to spread the word to Connecticut's young people." State agencies, hospitals, universities and legislators are being asked to participate in a working group to formulate a plan for ongoing publicity of the law to protect both children and mothers. "It is imperative that citizens are aware that a distressed mother may anonymously leave her newborn at any hospital emergency room if she cannot adequately care for the child," Boucher, whose district also covers New Canaan, said. "She and her child will be given matching bracelets so that she may come back for the baby if she changes her mind within 30 days. I hope community members will help me spread the word about this law. Many young people have no idea that it exists. By raising awareness about Safe Havens, we can save lives."